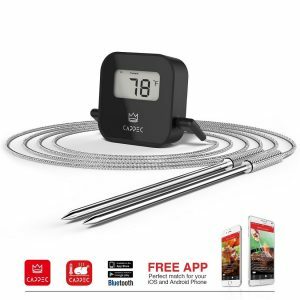 Cappec Bluetooth Wireless BBQ Thermometer is a grilling and smoker friendly meat thermometer that can be paired with both Apple IOS and Android products. This is a dual-probed Bluetooth-enabled digital thermometer that lets you set both time and temperature alarms via the unit itself or by using the downloadable app. The Cappec Bluetooth thermometer probes can withstand temperatures up to 600°F and can read temperatures up to 393°F. 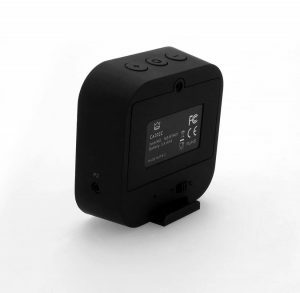 This compact little device is less than three inches tall and wide and weighs in at only 3 ounces. The front of the unit features an LCD display for reading the current and targeted temperatures. The Cappec runs on 3 AAA batteries, can read in both Fahrenheit or Celsius mode, is splash proof and has a built in, slide out stand. The Cappec Bluetooth Wireless BBQ Thermometer is made for the griller, smoker, or cook who doesn’t want too many additional pieces of equipment. 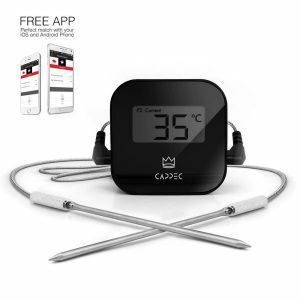 This Cappec thermometer connects to any android or ios smartphone with Bluetooth, meaning you don’t need an extra receiver to read your food’s temperature from inside. Instead, you can monitor your food through an included app on your smartphone. Cappec’s Bluetooth Wireless BBQ Thermometer has two probes on a wireless transmitter that sits next to your grill or oven. The transmitter sends the temperature reading to your smartphone via Bluetooth, allowing you to move more freely away from your grill. You can set a temperature range, so the application will alert you if your food goes outside the range. This can aid you in cooking separate dishes, playing with the dog, and being a bit less stressed about exactly how your food is cooking. The application also gives introspection to when the food may be done cooking. By graphing the food’s temperature over time, the app (and you) can make assumptions about when the food should be finished. The initial setup is simple enough. 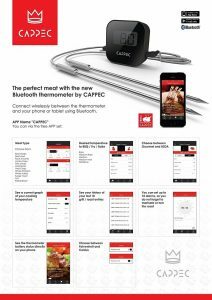 If you know how to install an app on your smartphone, then you can set up the Cappec Bluetooth Wireless BBQ Thermometer. First, download the app to your smartphone. Next, turn on your phone’s Bluetooth signal. Once you turn on the Cappec thermometer it should pair instantly to your phone. If it does not, then turn the thermometer off and on again, making sure the Bluetooth on your phone is turned on and ready. Setting up the temperature monitoring is also pretty simple. The application for your phone has several preset temperature controls, but you can also manually change the temperature you want to monitor for. Once you have set the temperature range you then insert the probes into your food (or grill). The temperature should update on your phone within seconds. Using the graph feature is done within the application too. It will be very apparent where the graph is, and it will read off the temperature of your food over time, allowing you to track the progress of your cooking. 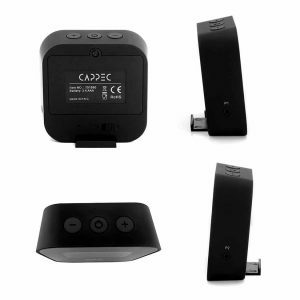 The Cappec Bluetooth Thermometer comes with several features that make it easy to use and unique in its capabilities. Between its Bluetooth capabilities, its unique-to-product application for smartphones, and its dual probe technology, this Cappec thermometer has a lot to offer buyers. Dual probe technology is one of the fundamental requirements of a good wireless meat thermometer these days, but it is still a very helpful feature. Being able to track two temperatures at once means cooking more types of food. It can also mean tracking your grill’s internal temperature. 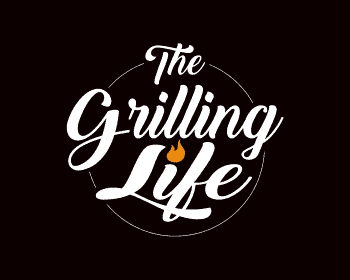 By placing one of the probes on your grill’s grate, you can monitor what temperature the grill is at, making sure it never dips in heat. Attaching via Bluetooth is a notable feature that isn’t seen as common as two-piece wireless thermometers. Everyone with a smartphone understands how attached they are to your pocket. It is rare to leave it behind somewhere. Because of this, you don’t have to worry about forgetting the thermometer’s receiver anywhere, because it is on your smartphone! There is no need for a secondary piece of equipment when your phone can do the job. Bluetooth is simple to use. You simply download the app for Cappec, turn on the Bluetooth on your phone, and turn on the thermometer itself. They will pair automatically, and start transmitting the temperatures of the probes instantly. The real perk of this Cappec thermometer is the application for your smartphone that it allows you to use. By pairing the thermometer to your phone, you can monitor much more than the real-time temperature of your grill and food. The application saves the temperatures that are transmitted to it, so you can see the temperature of your food over time. This allows you to track the rise in temperature, and see exactly how quickly your food is cooking. The app also gives you an estimation on when the temperature will hit your preset range. It acts as a presumed timer in a way. Though you can’t completely rely on the estimation, its gives you a good idea of when the food will be done. Who Is The Cappec Bluetooth Wireless BBQ Thermometer For? The Cappec Bluetooth Thermometer is great for anyone who wants an easy to use wireless thermometer and knows the basics of smartphone use. The Bluetooth connection and included app gives some awesome capabilities, and perks that are totally worth checking out. If you are looking for a way to monitor your meat without constantly checking the grill, this thermometer is worth contemplating. If you want to be pretty far away from your grill (over thirty feet), this might not be the best option in wireless thermometers. This Cappec thermometer is limited to about thirty feet of range with its Bluetooth. For anyone who has used Bluetooth before, you understand that is just how Bluetooth works. Whatever the reason, if you want to go further away than that, maybe look into other wireless thermometers that are pre-paired with their own receivers. They tend to go much further. The simplicity of use is a huge plus for the Cappec Bluetooth Wireless BBQ Thermometer. Even people who aren’t very tech-savvy should be able to figure out how to put the Cappec into use. Not needing a second piece with the thermometer, and being able to rely on your smartphone instead is another perk. One more piece to the thermometer is just one more piece to lose, and I don’t think many people will lose their smartphone so easily. The application is where the money is when it comes to the Cappec Bluetooth Thermometer. Being able to track your food’s temperature over time is helpful, and allows for a more accurate cooking time. The one big drawback of the Cappec is its limited range. Relying on Bluetooth means you can’t go further than thirty feet, and that is even pushing it if the signal is going through walls. The point of a wireless thermometer is to not be tied to your grill, and thirty feet is a short chain to work with. The Cappec Bluetooth Wireless BBQ Thermometer is priced between $30 and $60. I was not able to locate any contact info for the manufacturer anywhere on the enclosed documentation. The device does carry a 12-month limited warranty. It just wasn’t all that clear on how one would get the warranty service if needed. Cappec has a cool idea with its Bluetooth wireless thermometer, but it could use some sprucing up. The range of wireless connectivity is short enough to hold you back. For people not worried about moving far away from the thermometer, this is a useful product. But it seems to defeat the purpose in a way, not being able to move far from a wireless grill thermometer. The app can possibly make the limitations worth it though since it is pretty nifty to follow the temperature over time. Despite the limited wireless range, this is a well thought out little unit overall. It is a great space saver with a small footprint, has many useful features and performs well for smoking and grilling. I hope this Cappec Bluetooth Wireless BBQ thermometer review was helpful for you. As always, if you or someone you know is interested in grilling thermometers or you find this information useful, please consider sharing it with your Grilling friends and on social media! If you would like to leave a comment or have a review of your own to share on the Cappec Bluetooth Wireless BBQ thermometer, please do so below. We always welcome your input.